To edit a publishing information for a track that has already been added to your Revelator catalog, navigate to Assets from the main menu. Click the Tracks tab, search for the relevant track, click on it, and then click the Publishing tab. If you are editing all information for an album release, publishing information will be entered after entering track information. Enter the full name of a writer of the song. As text is entered, matching names from existing assets will appear, and may be selected. If there is more than one writer, you may repeat this process as many times as necessary. Enter the percentage share of the publishing rights the writer is entitled to. This will be used within Revelator for further accounting and earnings reports. Enter the name of the publisher. As text is entered, matching names from previously entered publishers will appear, and you may be selected from the list. 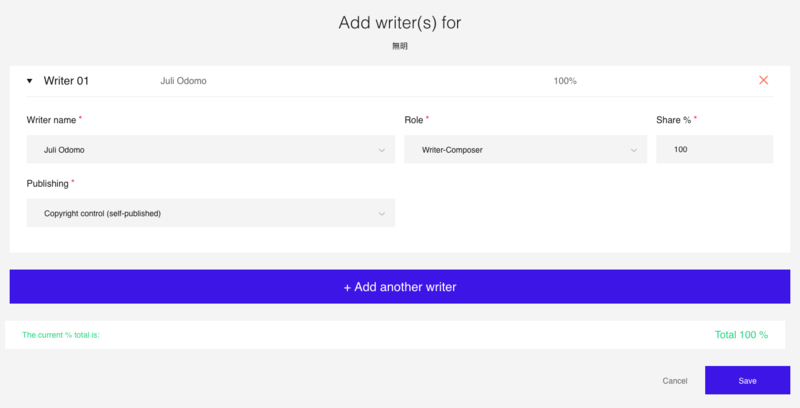 Click “+ Add another writer” for each additional writer with a percentage share of publishing. Click Save to confirm all entries and return to the Publishing information tab. When editing publishing information for an album, repeat this step for all available tracks as necessary. When all tracks have publishing information completed, click Next to continue on to Review & Save the release. Note: The Share percentage must add up to 100% for all writers included on each track.